A healthy way to start the day...or snack your way through it! Many times, parents are in a rush out of the house in the morning. After feeding their kids, they rarely have time to grab a nutritious breakfast for themselves. That usually leads to the dreadful drive-thru breakfast sandwich as the only option. These healthy, nutrient packed scones are a great option. They're easy to make and easy to grab on your way out the door! Heat oven to 350 degrees & spray the baking sheets with cooking spray (preferably vegetable oil spray). In a large mixing bowl, combine the almond flour, egg whites, vanilla whey protein powder, Splenda, oats, dark chocolate chips, chopped almonds, dried cranberries & raisins, cinnamon and nutmeg. Scoop out scone mix in 2 inch spoonfuls onto baking sheets. Makes 24 scones. 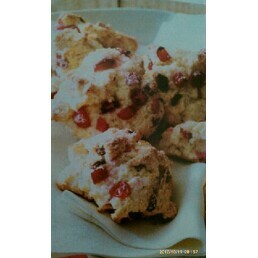 Each scone has approximately 135 calories, 9 grams of fat, 6 grams of carbohydrates, 2 grams of fiber & 7grams of protein.